NO Unauthorized Solicitations, Handbills, Sampling, Give-Aways, etc. Enjoy the relaxed atmosphere, but be proactive about the security of your belongings. If you’re concerned about your valuables, personal lockers will be available so you can you can free up your hands without worrying about losing anything in the sand. We provide safe, secure, and easy storage with all-day access so you can come and go to your locker at any time! Locker dimensions are 12” high, 12” wide, and 18” deep. What if I can’t find my ticket, I didn’t receive a confirmation email, or I have another ticket related question? All IDs must be valid, unexpired, unaltered, and must contain a photo. Can I re-enter the event? Re-entry is not permitted at any of our events. All tickets must be printed clearly in order to be scanned upon entry. Tickets may also be scanned from a smartphone. Our scanners will only be able to read a ticket on a phone if the screen is uncracked and the brightness is turned all the way up. Printing your tickets is highly recommended and guarantees the fastest entry. Can I have my ticket shipped to me? No. There are no hard tickets for this event. All tickets will be sent to the email which was used to purchase the tickets. Tickets may be printed out or scanned from a smartphone. What if my ticket doesn’t have my name on it? The ticket name does not need to match ID as long as ticket is printed and scannable. You will only need to present an ID for your ticket if it is not printed and you need to pick it up at will call. It should be noted that if you have an issue with a ticket we require you to have an ID matching the name on the ticket. Tickets may be available at the door however it is very likely that tickets will be sold out prior to the event. The door price is always higher than the pre-sale price and is subject to available capacity. If it says SOLD OUT online, there will not be any tickets available at the door. What time do doors open? When should I get there? Doors open at 2pm. Early arrival is highly recommended for this event. 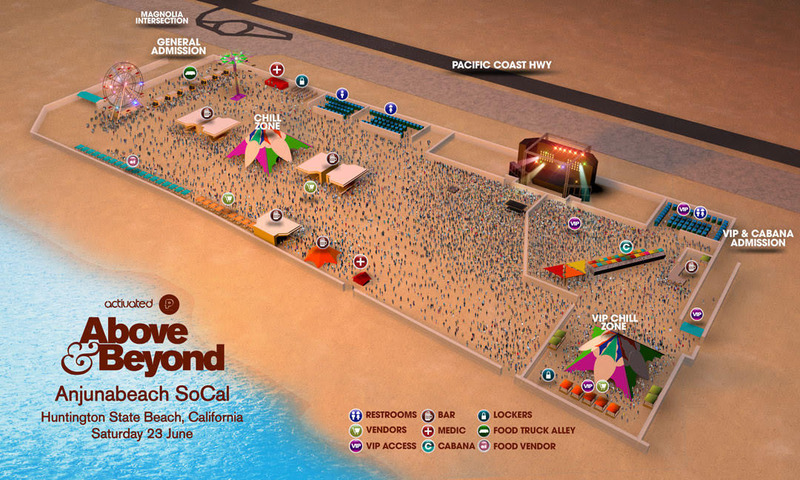 We will be offering shuttle parking to and from the beach. Parking is available for $8 (prepay online on our ticketing site) at OC Fairgrounds & Events Center, Costa Mesa. This location is 10-15 minutes from the venue. Note that there is one parking pass required per car, however each person in your group will require their own shuttle ticket to and from the event. Another option is to park at OC Fairgrounds and take a Lyft to the venue from there. You’ll get a Lyft Fast Pass wristband for quick admission into the event through dedicated Lyft admission line. There will be very limited beach parking (separate parking fee paid directly to parking lots), and metered street parking. We encourage ride sharing transportation, riding bikes, walking and other forms of transportation. Please carpool and always have a designated sober driver. There will be very limited beach parking (separate parking fee paid directly to parking lots), and metered street parking. We encourage ride sharing transportation (Uber & Lyft), riding bikes, walking and other forms of transportation. Please carpool and always have a designated sober driver. There are no refunds or exchanges. All sales are final. Event terms are rain or shine. Artists and venue are subject to change at any time and is not grounds for refunds. If the event is cancelled, we will refund the amount you paid for your tickets using the same payment method used for purchase. If your event is postponed, we will contact you with the new date and time. All event personnel have the right to refuse entry to any ticket holder for any reason at their discretion. Venue and talent are subject to change without notice and are not grounds for a refund. Can I upgrade to a VIP ticket? Please contact info@activatedevents.com regarding ticket upgrades. Same day VIP upgrades can be purchased at the event based on available capacity. All ticket sales are final. Please note that management reserves the right, without the refund of any portion of the ticket purchase price, to refuse admission to or eject any person whose conduct is deemed by management to be disorderly, who uses vulgar or abusive language, or who fails to comply with these or other management rules. Patrons who are clearly intoxicated or under the influence of drugs will not be admitted. Will set times be posted in advance? Yes. Set times will be posted on the website and social media pages a couple days before the event. Will there be food and drinks available at the event? Vegan? Gluten-Free? Yes! There will be a variety of food and drink options available to accommodate most dietary needs. Please reach out to info@activatedevents.com for specific medical inquiries. The event is open seating as it takes place right on the sand. If wheelchair access is needed, special sand wheelchairs are available at any of the State Park's parking gates. Sand wheelchairs are loaned out free of charge on a first come-first serve basis. They allow you to easily move across the sand. Please contact info@activatedevents.com for any additional questions.